When I first wrote about the Pentax Espio, I mentioned “unpromising results,” kvetched a bit about Walgreens mailing off and then keeping my negatives, and then promised to write up a proper review once I put another roll through. Well, I did put another roll through it, a year ago, back when I first started developing my own film, but then never got around to (or forgot all about) writing up a review. After that second roll, I shelved the Espio in favor of the LC-A and, later, the FG, but when I decided to start up a roll Thanksgiving morning, both of those cameras had film in them already, so I grabbed the Espio, loaded the CR 123A battery that I had pulled out of the camera back when I shelved it to keep the date counter from draining it unnecessarily, auto-loaded a roll of film in it,* and away I went, excited to have a zoom lens with even a small range, on an automatic exposure camera with “Full Macro” stamped on the front, and also excited to see how it would perform. With a 8 buttons (1 to power-on and -off, 3 for the date settings, and 4 for various shooting and flash modes) plus a zoom toggle and shutter release, this is one of the simpler electronic cameras I’ve played with lately. Here are the (impromptu and unplanned) “product shots” together if you want to take a closer look. I wish I’d known some of that before I started shooting… And no wonder the flash turns on automatically whenever you start up the camera. Anyway, I loaded up a roll of Agfa Vista Plus 200 while cooking up the cranberry sauce Thanksgiving morning and started trying to document the festivities. I even turned on the date stamp function for some extra fun. The front of the camera has “Full Macro” stamped on it, and given my predilection for macro fun, guess where my first stop was? I hadn’t bothered to check the settings, and so didn’t notice that the flash powered up automatically. As soon as it popped, I muttered something unprintable and countered with “Astagfirullah,” then checked the top panel and mashed the flash button till the obvious ‘Flash Off’ symbol appeared and tried again. If I haven’t mentioned ‘RTFM’ before… RTFM. As noted above, and despite “Full Macro” stamped on the front of the camera, the closest focusing distance is .6 meters, or roughly 2 feet. That’s never going to reach 1:1 or even 1:2 with a 70mm lens. Pouring over the manual after the fact reveals that the maximum magnification is 1/7.5x, which is a long way from any macro I’ve ever heard of. A piece of film is 36mm wide, and a proper 1:1 macro lens would reproduce an object 36mm across. The macro mode on the 28-105mm D renders objects 72mm across. 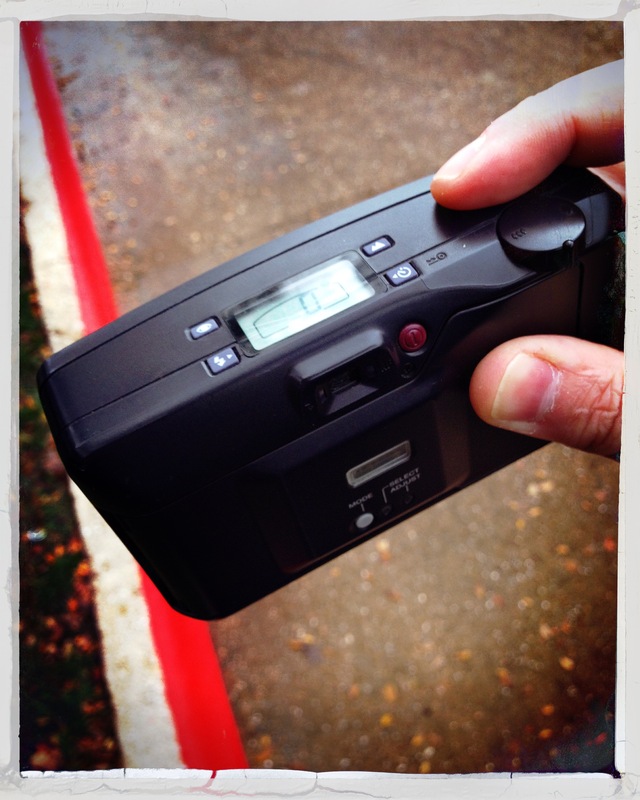 The maximum width the Espio will render on film is 270mm, and that’s considerably larger than a piece of 35mm film. I sorta like the two cranberry sauce pictures regardless, but they’re not what I was hoping for. My cranberry sauce is delicious; those photos are not. It’s not even clear what those are pictures of, really. Anyway. The Espio has a handy automatic shut-off feature to save battery life. After about 30 seconds of no action, it powers down and you need to turn it on again. When it comes on again, at least on my copy, with 200 speed film in it, indoors, the flash powers on again, so when I went to shoot the giblet gravy (in progress): pop! But it’s a decent flash, more or less. This one shot may get me interested in flash photography again… flash has its uses, for sure, and I like the cheesy, garish light on the handle and the little connection points and the glare bouncing off the rim and lid are sorta interesting. Anyway. At the right distances, the Espio’s lens is sharp and contrasty, and it gives decent enough results with flash or without. The giblet gravy was good… not quite as dark or as tasty as Granny’s but good. If this was a digital camera, by this point in the day I would’ve chimped already and known something about the close focus capabilities. And if I’d read the manual, I would’ve known that the flash was probably necessary at f/4.7, ISO200, with a minimum automatic shutter speed of 1/5th, and especially since I can’t handhold a 35mm lens at 1/5th… 1/15th, maybe, and 1/30th for sure, but 1/5th? Never. So it’s no wonder that virtually the entire roll was mis-focused—me trying to focus on something closer than 2’—or had camera shake blur—me unaware of the shutter speed limitations. The carpet is sharp, at least, even without flash. And I do like the on-camera look, sorta. There’s something nostalgic about it for me, even though I never shot many cameras with flashes on board, and if I did, I usually shut it off if possible. So indoors, with 200 speed film, let the flash fire. Outdoors, though, it does more or less fine, as long as there’s enough light. If you’re in deep shade, forget about it: hello camera shake blur, or use the flash. But in full sun, or even full cloud cover at high noon, you’re good, though it might overexpose a bit at f/8 and 1/400th. So that’s about all I have to say about the Espio. There are a load of things I didn’t test and that might be fun to play with, like the multiple exposure mode and the wide-tele consecutive shooting mode, so I might have to run another roll through it one day. I probably know enough now to avoid making the same mistakes again, though I’m almost guaranteed to make some mistake. When and if I do shoot it again, InshaAllah I’ll play around with some of those things and let you know what I find. So… some final thoughts… In a previous roll, I got some decent shots with the Espio, outdoors, with plenty of light, at reasonable distances. With this roll, I got a bunch of blurry stuff and more or less wasted my last roll of Agfa Vista Plus 200 (which is thankfully rather cheap, so it’s not a huge loss) and lost most of the Thanksgiving festivities to camera shake or too-close focusing. If you find the Pentax Espio 35-70mm AF Zoom in a thrift store or something for a couple of bucks, it’s probably worth picking up. The lens is sharp enough, and it works well enough. But don’t expect too much out of it. Oh! and before I forget, according to the manual (available from Butkus, thankfully) the two digit year counter will take dates from 87-19… so if you want the date printed, you have a bit more than 3 years before you lose the chance for the next 67 years.